As a species on this planet, we share one simple dream, it is to live in a peaceful world. Achieving this dream may seem an insurmountable challenge considering the war inside ourselves and in other parts of the world. But, we can do it one step at a time, in our own little way. This is Dr. Jane Goodall’s message. Dr. Jane Goodall is an environmentalist and primatologist, who earned fame with her long term study of wild chimpanzees in Tanzania. Because of her remarkable contributions to sustainable development, Dr. Goodall received an appointment from the United Nations as its Messenger of Peace. With this appointment, Dr. Goodall pledged to carry the message of peace as she travels around the world. 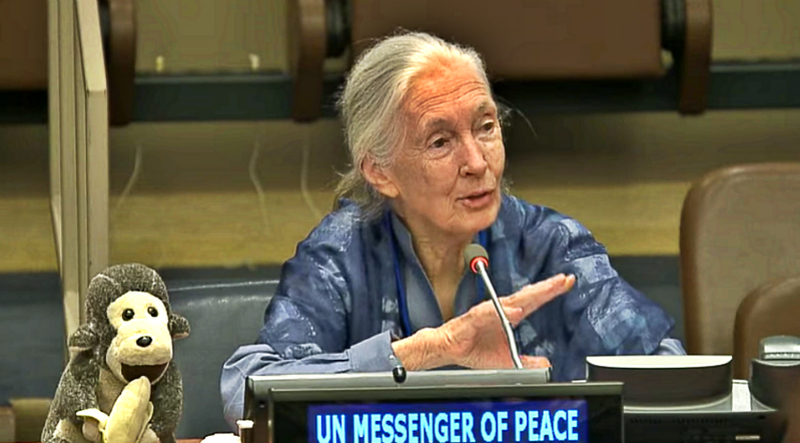 In her speech during the International Day Of Peace, Dr. Goodall shares the following points as guides in making our contribution to the peace of the world. 1. Peace starts within ourselves. Peace should start within ourselves. If we can define within ourselves what peace is, then we’re able to spread the message of peace around the world. 2. Spread peace every single day. Finding peace might be difficult for some people, especially those in refugee camps. But we can begin by making the world around us just a little bit better every single day. When we know that we’ve done our best even in the midst of challenging situations, it gives us a good feeling that can lead to inner peace. At the end of the day, this is what makes us better able to help others more. 3. Make sure your choices lead to peace. Each of us must realize that we can make an impact on the planet each day of our life. We can do it by the choices that we make, what we buy, what we eat, what we wear, and the decisions we make that will affect future generations. 4. Respect for others creates peace. There is the threat of a nuclear war, but let us not allow these things to deter us from achieving our dream of world peace. We only need to focus on respecting each other, learning more about each other, and accepting differences in our culture, customs, and even religions. Religions may be causing conflicts, but we also need to realize that every religion has one single rule, and that is to do unto others as we would have them do unto us. 5. Let’s share peace with other species of the world. We have the power to stop the war that we’re waging on the natural world and on the environment that supports us. We need to stop destroying our planet to prevent climate change. We also need to remember that we’re sharing this planet with other species who are starting to disappear because of our collapsing ecosystem. Animals have emotions and feelings too. They feel pain and fear. Humans are not the only refugees in this world, but also the animals who are losing their homes, dying, and suffering. 6. Use social media to spread messages of peace. There’s no need for us to bring about peace on a world level. We can begin in our community, in the people around us, and in nature. One simple way of doing this is using social media to our advantage. The social media can bring people together around an issue. Once we’re aware of certain issues, going out and taking action is much easier. 7. Each of us has a role to play to bring world peace. Each of us has a role to play in this world. Even if some of us may not know it yet, but we can make an impact in this world if we just want to. Al we need to do is share peace and love around us.